It is always great to have a real life example to help. Today’s apparent failure causing chaos nationwide is PERFECT. Many birds, one stone. A company, Amadeus, has successfully innovated and created a platform for airline operations that many airlines have adopted. Not surprising actually since user friendly and airlines have rarely been expressed in the same sentence. Apparently this morning there was a problem. A large one. One that affected most/all airlines using the system. Reservations, kiosks, gate agent operations, et al. In June 2016 I snapped a photo of Amadeus in action at AUS. It was in stark contrast to the text screens that agents used in decades past. Note the ability for multiple airlines to share one gate. Awesome. If it works. ALL the time. Disaster Recovery? – Amadeus? Airlines? Why are passengers affected when a single vendor fails? Regulators – Is it acceptable for a single vendor to be allowed to substantively disrupt airport operations globally? Attackers – Want to inflict max chaos and disruption to critical infrastructure? A single vendor may all you need to target. Protectors – Do you trust your vendors? Based on what evidence? 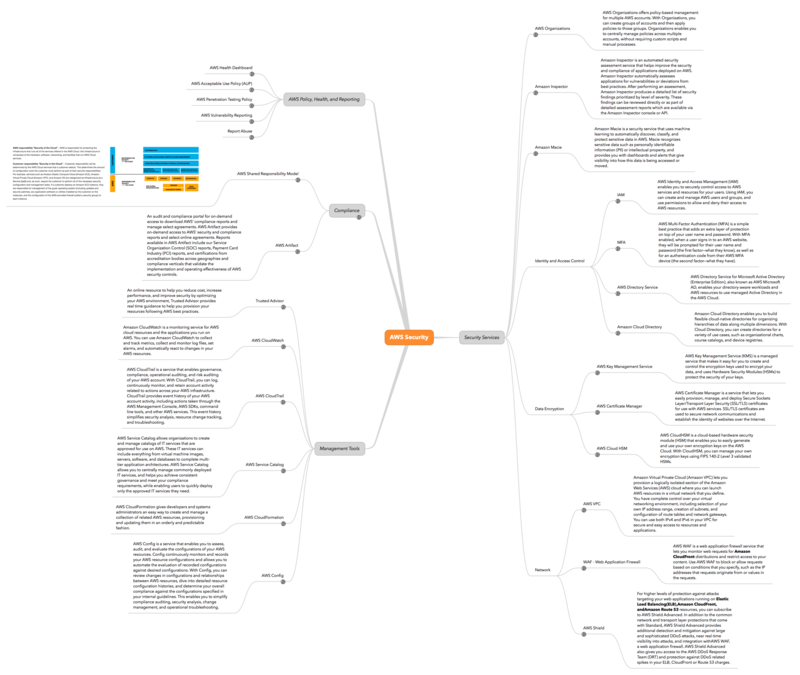 Sharing a mindmap image I created to visualize available AWS services, policies and procedures relevant to security. I’ll be speaking on Cloud Security at ISC West on April 6, 2016. I attended last year and blogged about my experience. This year I’ll be wearing two hats and advocating on behalf of both enterprises and cloud service providers with a goal to improve the security of both. Fiber Cut? No Internet, Mobile or SMS? Are You SOL? I woke up this morning thinking about the increasing impact that any disruption between us and the Internet has in our daily personal and professional lives. I love the security profession but sometimes it drives your brain to an offroad or two (or more) that many people do not oft travel. Think. What use is your smartphone, computer or tablet if it loses all ability to communicate with anyone or anything else? When fiber is cut and Internet and phone service are down it often affects an entire community or region. If this disruption occurs inline with a disaster, either natural or terror, lives can be at risk. Fortunately most fiber cuts to date are accidental the result of an errant backhoe or other less than nefarious cause. This is changing. Intentional cuts in the Bay Area in 2015 and allegations from Verizon that striking workers intentionally cut fiber are troublesome indicators that our fiber optic networks will increasingly be a target for those with a desire to disrupt. But what is old is new again. The first recorded telecommunication sabotage took place during the second battle of Bull Run in 1862. I would argue the stakes are no higher today just different. The business impact of a fiber cut can be measured quantitatively and qualitatively. I dare you to go brick and mortar shopping in a region experiencing a fiber cut. You will quickly learn which retailers have the most resilient and effective disaster recovery and business continuity efforts. Most retailers rely on fiber for every connection they make at the point of sale or otherwise. The fallback is normally satellite and works much more slowly, if it works at all. And you thought the lady ahead of you in line at Wal-Mart buying 500 cat key chains insisting on 50 separate receipts was slow. The inability for teenagers to reach their friends via Facebook, Snapchat, SMS, phone or any other means other than face to face may seem in the moment catastrophic but is in reality only a symptom pointing to a future where the stakes are much higher. Today Alexa’s inability to respond from the mothership to turn off lights and tell dad jokes arguably worse than my own is but a minor annoyance. Future Alexa controlling my in home medical devices, fire suppression systems, and life safety equipment sets the stage for a future where being always connected is as critical as having water, power and oxygen to breathe. Ensure you have multiple Internet connections over disparate paths. Businesses in mission critical industries do this as a normal course of business. I recommend small businesses and families do as well. My small business maintains two Internet connections and a satellite backup. Keep in mind fiber cuts often render all land based communication useless. Maintaining satellite Internet as a backup is a relatively cheap insurance policy. We use Exede. Invest in a SOHO router that manages multiple Internet connections and provides for automatic failover/failback. My preference is CradlePoint. Invest in an out-of-band communication technology to ensure that fiber cuts or other outages do not prevent you from reaching your family or business associates. Not fully baked but amongst the most promising and exciting innovation for communications not reliant on Internet or even mobile coverage are these two companies. Beartooth and GoTenna. Both systems utilize a combination of your smartphone and a built in 900 mhz unlicensed radio frequencies to allow communication over several miles with no dependency other than a similar device on the other end. Although GoTenna appears more consumer friendly and geared towards the social, crowdsourced model they do purport to have a mission critical “professional” line in the works. I’ve ordered a pair of GoTenna devices and will be posting a review after some time assessing their merits and limitations. As always feel free to reach out to me directly via LinkedIn if you would like more information about this topic or any other. Austin’s @pivot3 recent tweet of an @ITWire article about the projected growth in the HCIS (Hyperconverged Integrated Systems) market contain a couple of nuggets of information that demand expanding upon. First: Hyperconvergence has yet to enter the mainstream. This is true. The article states that while HCIS is the fastest growing segment it will be less than 1/4 of the integrated systems market by 2019. Innovators and early adopters are clearly benefiting from the fruits of hyperconvergence, namely software centric infrastructure built upon commodity hardware to deliver transparent solutions to internal and external stakeholders quickly and efficiently. That said early adopters are also on point to absorb the inevitable pain of industry upstarts and established giants finding and exploiting a particular market niche and redefining their solutions on a path to revenue nirvana. Pivots, acquisitions and chaos lay ahead for some. As evidence some friction has arisen between Dell and EMC as they struggle to understand how Nutanix fits into their new world order. Secondly: Hyperconvergence use cases have been limited and silos have emerged. No kidding. If you treat hyperconvergence like a traditional enterprise point solution, roll with a limited POC, and get frustrated when the touted benefits are not realized, then you deserve your fate. Hyperconverged excellence requires a philosophical shift to a software first/software only mentality from the help desk to the CIO. Hyperconverged excellence requires that you are willing to shrewdly assess your organization and act to make the necessary changes to be successful. Blockers must be eliminated be they technological, cultural or personnel. Hyperconvergence holds great reward only for those organizations that understand the revolution at hand and have the courage to execute. The irony is that those that languish in perpetual POC hell will eventually abandon their infrastructure entirely for a public/private cloud solution managed by someone that achieved hyperconverged excellence long ago. Last week I had the opportunity to attend ISC West billed at the “largest security industry trade show in the U.S.” Held annually at the Sands Expo in Las Vegas the show features over 1000 exhibitors and is attended by over 28000 security professionals. Make no mistake ISC West is largely a physical security conference. The sheer number of cameras, access control solutions, retractable electronic bollards, electrified fencing and oddly skin care vendors was staggering. 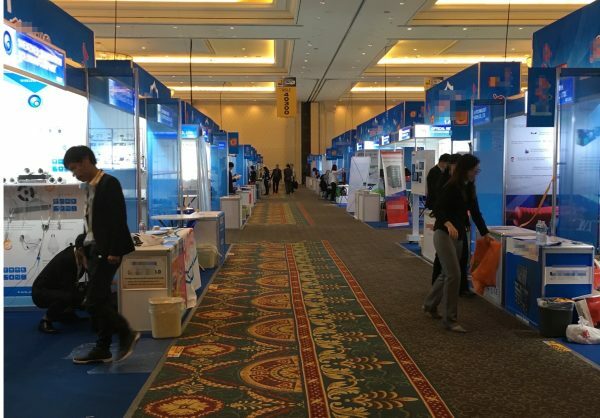 For the first time the show included the Connected Security Expo a cybersecurity conference within the larger conference. A recognition that many of the aforementioned vendors now manufacture internet connected devices that need to be secured (with the probable exception of the skin care vendors). As a Technologist – Very Cool. As a corporation you can actually buy a drone fleet and patrol your perimeter, then deploy a robot to investigate and intercept violators. All remotely controlled and monitored. As a CISO – Abject Fear. Very few of these IoT device manufacturers appear to have any expertise in cybersecurity. I’ve probably spent more time thinking about their supply chain and secure software practices than they have. As a Security Entrepreneur – Unlimited business opportunities abound. See CISO thoughts above. We can expect 200 billion new devices to come online by 2020 according to Matthew Rosenquist of Intel. Many of these devices will impact life and safety. Vehicle control systems and medical devices are examples. The bad news is that a significant amount of blood will be spilled in the next few years. Innovation has always outpaced cybersecurity but now the consequences of failure include the likelihood that people will die. Are we ready for this connected future? We had better be. There is no other choice. Part 1 introduced the concept of transforming a paper “security contact” into a security liaison for your organization. My experience working with organizations is that while most have a security contact attached to an asset or functional area many of the designated contacts when asked are surprised to learn of their role. This is a sure indication of checkbox compliance and missed opportunity. Creating a security liaison program is an exercise in taking a latent asset tied to a compliance objective and activating them to become an active participate in the overall security of the organization. Policy – Authorize the security liaison program by writing it into your overall security policy. Define the role and overall responsibilities of the liaison. I’ve found that the liaison program tends to map closely to the security steering committee so placing this section immediately following the steering committee makes sense. Process – Make it real. Make it auditable. Meet regularly with your security liaisons and document much as you would for the security committee. A functioning security liaison program can be used as a control at audit time to show the maturity of security within your organization. Empower/Enable – Assign real responsibilities. Enable your security liaisons to participate in your risk management program and other key areas. Empower them to drive improvements to the security of the organization by encouraging them to ask hard questions that may not have easy answers. Empower your liaisons by allowing them to communicate/report issues and progress to the security committee/leadership. The overall goals of any security program are to reduce risk and increase security. Adding security liaisons can be a key component of your overall security strategy. A group created with zero additional headcount, authorized by policy and doing your security bidding? It is only a dream if you don’t act. The problem is well rooted and endemic. Security organizations and their leaders are overwhelmed, understaffed and facing an unprecedented volume of new threats both inside and outside their organizations. A natural human reaction to such conditions is to retreat, become reactive, siloed and isolated. Effective security leadership requires we counteract these conditions by finding solutions in spite of organizational (and personal) limitations. Enter the “Security Liaison”. Initially the security liaison can be viewed as nothing more than a “security contact” for an organizational unit, project or application. A designated individual that can be contacted in the event of an incident or other security related issue arises. Nothing interesting or compelling at this stage, innocuous and innocent, right? Stay tuned. Part 2 introduces techniques and tactics to transform the security liaison from a passive “contact” to an active participant in your security efforts. I tweeted the other day in response to a blog post I read which seems to be an upward trend of information intended to help CISO’s disseminate information to their board of directors. Good actionable information for sure but I feel the need to push the envelope a little and provide some unvarnished and unsolicited observations about boards. In many cases these individuals are highly competitive and often do not like other board members. Rule of thumb: Boards are at often AT LEAST as dysfunctional as the organizations they govern. Some board members do not understand the business – Many times especially within smaller companies board members will be family members that have no clue what the business actually produces let alone how it operates. If they do talk to the CISO they may ask what kind of gun they carry. “You are security, right”..? Don’t spend much time on these folks. Rule of thumb: Focus efforts on board members that can actually spell vulnerability. The bottom line is that success in the boardroom is the same as success in life. Observation, seeking to understand, developing relationships, being strategically humble for tactical gain are all key. The Certified Cloud Security Professional Certification (CCSP) was announced by ISC2 in conjunction with the Cloud Security Alliance (CSA) this morning. I have included both the exam outline and brochure for easy reference at the bottom of this article. The new exam includes six domains and requires 5 years of IT experience, of which 3 years must be in information security. Interestingly the CSA’s existing CCSK certification (Certificate of Cloud Security Knowledge) can be substituted for one year of information security experience. This protects the CSA’s investment in what to this point has been the only other relevant certification available since the advent of the “cloud”. The CCSK certification is now clearly positioned as entry level and accessible to everyone at nearly any skill level. Inline with this announcement was the release of the FrostSullivan-(ISC)²-Global-Information-Security-Workforce-Study-2015. A quick search of the document returns 29 references to “cloud” which I will explore more in an upcoming article. If software is eating the world, then the cloud must be its digestive system. Those of us that work “in the cloud" know what a messy job it can be. We are riding an unprecedented wave of technological innovation that is both awesome and terrifying. Rapid change, incessant unrelenting noise and the need to transform organizations seemingly overnight makes sanity a stretch goal, at best. Writing about it helps me. I hope it can help you in some small way as well. Stuart is a security strategist, consultant, and entrepreneur. His 25 years of converged security experience span a diverse spectrum of law enforcement, venture backed startups, and high growth multi-billion dollar financial services firms. He has served in the role of Reluctant CISO for the last 15 years. He is not particularly fond of the role but gains great satisfaction when his efforts results in measurable improvements to the security and overall maturity of organizations. As a commissioned Texas Peace Officer and CISO (Chief Information Security Officer) Stuart is uniquely positioned to serve as a bridge between law enforcement, technologists and the public. He writes and speaks frequently on technology, law enforcement, and cybersecurity topics.